Prepared by adding quality Barolo wine during cooking, this is a delicious desert to end a meal. Ideal with cheese or icecream. 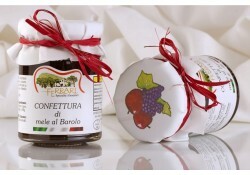 Ingredients: apples (60%), sugar, Barolo DOCG Wine (29%), lemon juice, cinnamon. May content trace of nuts, gluten.